It is the short name that the Japanese give to the Shikoku pilgrimage (the great island in front of Hiroshima). The main route is composed of 88 temples. is about 1140 kilometres, if we do viste as the 88 temples. 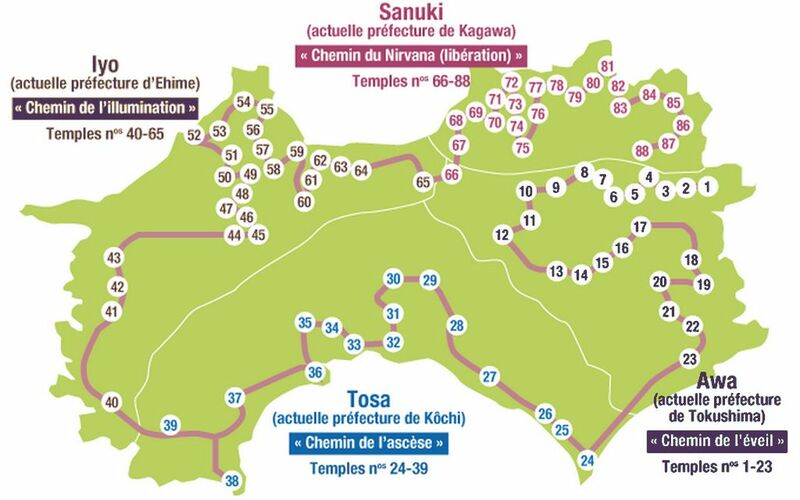 But it can reach 1400 km if it iterates through all the sacred sites linked to Kobo Daishi. It crosses the 4 prefectures of Shikoku, each corresponding prefecture to a part of the road to spiritual awakening. This pilgrimage would be 1200 years old but it became especially popular at the beginning of the time Edo after the publication of a guide published in 1689 by the Buddhist monk Yūben Shinnen. The pilgrim is called Henro or O-henro, the respectful form. The short Henro Michi (the way of the Pilgrim) way pilgrimage. He is dressed in general in a white habit (I there would return in detail later). The Pilgrim, the kongozue stick, is very important. Not only is support for the market, particularly in the slippery roads, but it is the symbol that we walk not alone. Kobo Daishi (Kukai) we accompany and help us to overcome the difficulties. There are top registration Dogyo Navik (同行二人). This means that you are not alone on the path of the pilgrimage, Kukai is always at your side. At each temple, it must burn incense, light a candle and reciting of sutras. There also I would later return in detail at these rituals.